1. A dog musher asks his dogs to pull the sled. The dogs refuse, referring to Newton's 3rd Law in their defense. They feel that since the sled will pull on them with the same force that they exert on it, they won�t be able to go anywhere. They say, �If we can never exert a forward force on the sled which is greater than the backward force it exerts on us, how can we ever get the sled moving?� Discuss the validity of this defense with your group, and construct a counter-argument using Newton�s Laws. 2. If a mosquito hits your windshield, which is greater, the force of your car on the mosquito, or the force of the mosquito on your car? Which accelerates more during the collision, the car or the mosquito? Justify your answers carefully! 3. A heavy lifting crane is being used to stack cargo containers on the deck of a ship. The heaviest container weighs 10 tons (= 20,000 pounds = 89,000 N). How much force should the crane�s cable support if it lifts this container with an upward acceleration of 1 m/s2? How would this answer change if the crane were sliding the heaviest container up an inclined plane (frictionless) making an angle of 30 degrees with the horizon. Please assume the crate lies flat on the plane and that the cable pulling it is parallel to the surface of the plane. 4. The graph shows the velocities of two objects of equal mass as a function of time. Forces FA, FB, �, FF acted on the objects during intervals A, B, ... , F. Which of the statements below are correct descriptions of the magnitudes of the forces? 5. Which of the following situations results in a greater tension in the string? In both cases, the strings can be considered massless and the pulleys frictionless. Prove your answer using Newton�s Laws. 6. 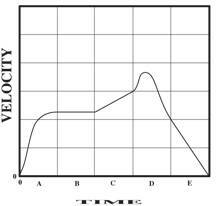 The graph shows the velocity of an object with a mass of 10 kg. Each line on the time axis represents 3 s and each line on the velocity axis represents 3 m/s. 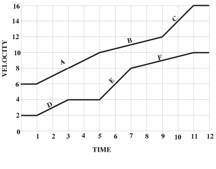 Which of the following statements, describing the graph are true? � In section A, the force acts in the direction of the velocity and is increasing. � In section B, the force is constant and non-zero. � In section D, the force is always positive. � In section C, the force is positive. � In section D, the displacement is negative.